Step 3: Chose the Internet Tab. Step 4: Select the history you would like to save. Step 5: Hit 'Save Shortcut' to save as .url files in your specified location. TouchCopy allows you to browse through your iOS device's Internet History and Bookmarks, and allows you to save these pages as links or to open them on your preferred browser. To view the Internet data stored on your iOS device, click the Internet button in TouchCopy. TouchCopy displays the internet Bookmarks stored on your iDevice, as well as Safari's browsing History. 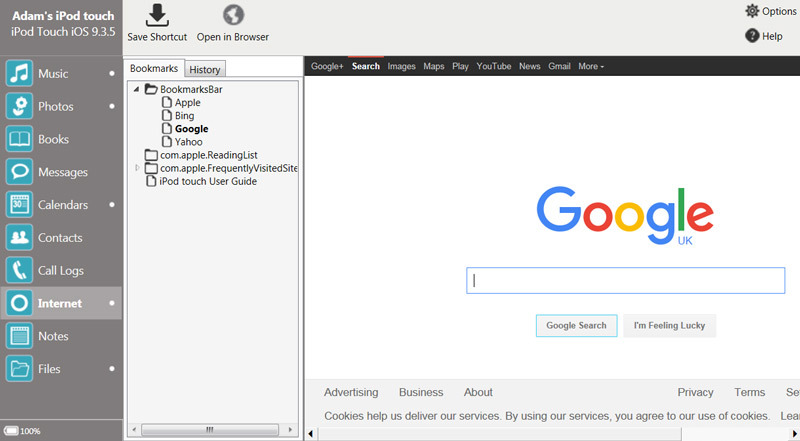 Clicking on a website in the list displays the website on the right side of the window, if there is an internet connection. Select which website you want to access; you can now click on "Save as Shortcut" and select a destination to create a link file (.url) to the website you have selected. Alternatively, you can press "Open in System Browser" to open it on your operating system's preferred web browser (such as internet explorer, mozilla firefox, google chrome, safari, etc).